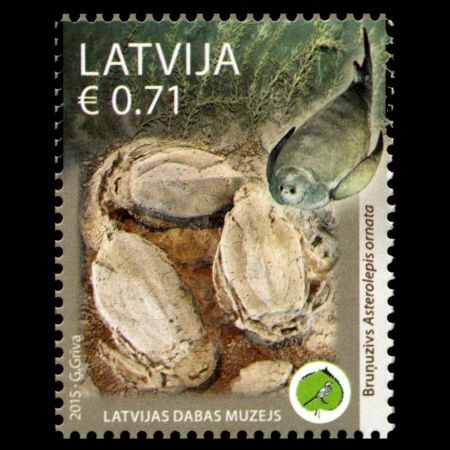 Latvia 2015 "Latvian Museum of Natural History: Placodermi - Devonian fish"
On February 20, 2015 Latvian Post released first stamp in new series dedicated to 170 years of operation of the Latvian Museum of Natural History. 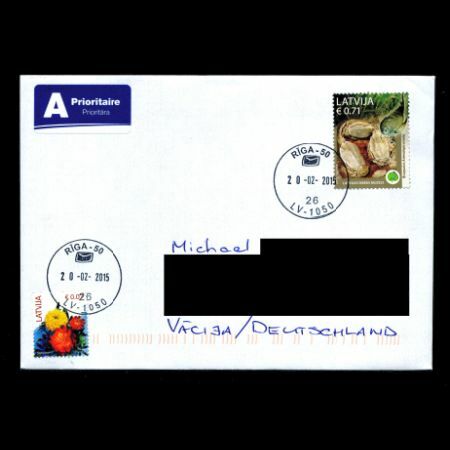 The stamp has a face value of € 0.71, corresponds to a simple class B for sending letters to any of the European Union and shows reconstruction and fossilized remains of prehistoric fish Placodermi Asterolepis ornata, approximately 384 million years old. The Latvian Museum of Natural History is the largest and one of the oldest museums of natural history and sciences in Baltic States. The Latvian Museum of Natural History originated from the museum of Riga Naturalists Society (Der Naturforscher-Verein zu Riga) that was founded in 1845. The objectives set by the Society at that time are linked with the current objectives – the preservation, maintenance and research of the natural collection, active environmental education, the formation of permanent and temporary exhibitions. The Latvian Museum of Natural History is a marvelous place where to pass time and view modern, interactive displays and varied exhibitions, go on excursions, guided by environmental interpreters, to participate in various informative and educational activities on environmental and natural studies, to discuss the topical and latest events on nature issues, to see a wide range collections of natural resources. The oldest objects in the museum's collection associated with Nikolaus Himsel (1729-1764), a collector of natural objects. There are about 600 items remained from its collections . This is - minerals, shells battleships, a small collection of horns and bones. Very valuable legacy came from tp the museum from Riga Society of Naturalists, is a rich natural science collections, collected both in Latvia and worldwide. Paleontological collection of the museum present fossils of animals and plants collected in the territory of Latvia and the neighboring countries. There are fossils of algae 2 billion years old and relatively young fossils of mammoth and other animals of the Quaternary period, 10 000 years old . Great value represent diverse collection of fossils of the Devonian armored fish. 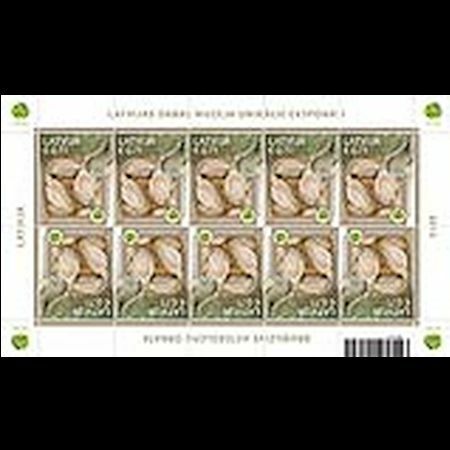 A special presentation event in honor of the first stamp in the new series will see the participation of representatives of Latvijas Pasts and Latvian Museum of Natural History; besides, visitors will have an opportunity to view the exhibit depicted on the stamp – the placoderm fish – accompanied by a museum specialist. 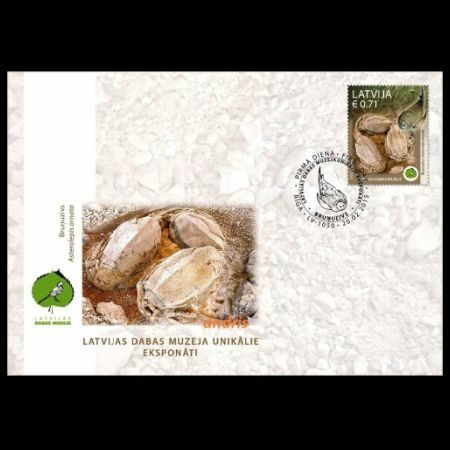 A speech during the special presentation of the stamp at the Museum is to be delivered by Latvijas Pasts Chairman of the Board Arnis Salnājs and Latvian Museum of Natural History Director Skaidrīte Ruskule. At the end of the presentation, everybody interested will have the opportunity to listen to a short story about the placodermi fish and also have a look at this fish and other exhibits of the paleontology collection in the Museum’s exhibition. 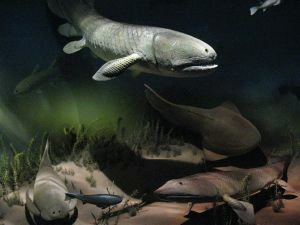 Prehistoric fishes diorama at the Latvian Museum of Natural History. Placodermi is on the bottom-left corner. Placodermi is an extinct class of armoured prehistoric fish, known from fossils, which lived from the Silurian to the end of the Devonian Period. Their head and thorax were covered by articulated armoured plates and the rest of the body was scaled or naked, depending on the species. Placoderms were among the first jawed fish; their jaws likely evolved from the first of their gill arches. molluscs. Placodermi Asterolepis ornata specie is the most common fossils found in the Devonian fish fossils in Latvia - mostly only small fragments of bone plates. However, in 1970's some unique discovery of the fossilized remains of the prehistoric fish are made. Nowadays, this specie is considered to be the most detailed studied Latvian Placodermi. 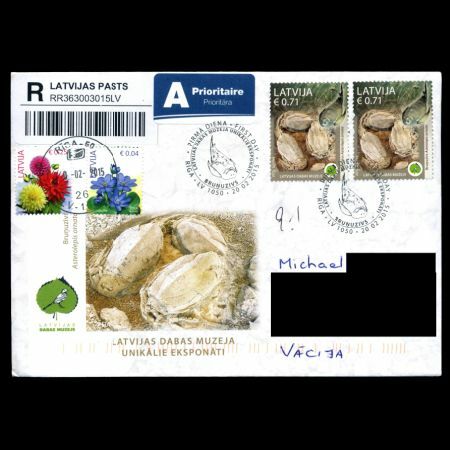 The Placodermi specie depicted on the stamp, studied by Jelgava-born naturalist-paleontologist Eduards Eihvalds (1795-1876) , who gave the scientific name for it in 1840. Karl Eduard von Eichwald (Eduards Eihvalds), borned on 4 July 1795 in Mitau, Courland Governorate and dead on 10 November 1876, Saint Petersburg; Russian was a Baltic German geologist, physician, and naturalist, who worked in Russia. Eichwald was a Baltic German born at Mitau in Courland Governorate. 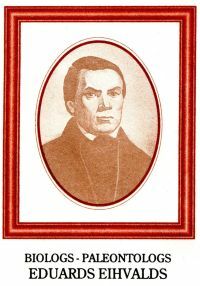 He became doctor of medicine and professor of zoology in Kazan in 1823; four years later professor of zoology and comparative anatomy at Vilnius; in 1838 professor of zoology, mineralogy and medicine at St. Petersburg; and finally professor of palaeontology in the institute of mines in that city. He travelled much in the Russian empire, and was a keen observer of its natural history and geology.